The Telangana state Public service Commission (TSPSC ) will conduct the Teachers Eligibility Test (TET) to recruit 8792 teachers in Telangana on July 23. The Deputy Chief Minister and Education Minister Kadiyam Srihari said the notification for TET will be released on June 9 and candidates can download the detailed notification from June 12. The candidates have to submit the applications online through tstet.cgg.gov.in from June 13 to 23. TSPSC will organise a special help desk to assist the candidates from June 12 to 23. The candidates have to pay fees from June 12 to 22 at TS Online or payment gateway The Minister informed that the TET examination was last conducted in May, 2016. 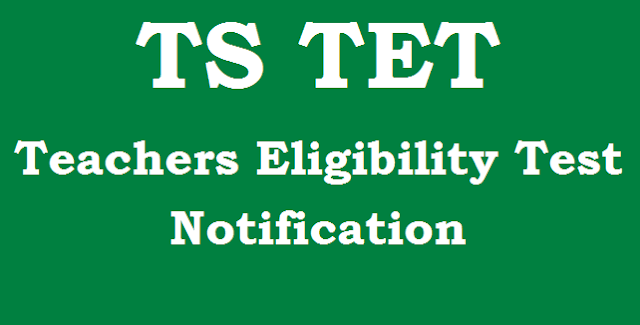 TS TET 2017/telangana tet 2017/ts teachers eligibility test 2017 notification, online application form, how to apply, last date for apply online, exam date, eligibility criteria, fee details are given here.. The fee prescribed for appearing for TS-TET (including examination fee) is Rs. 200/- (Rupees Two hundred only) for only Paper-I or only Paper-II or both. Candidates can pay the fee through TSonline or Payment Gateway centers between as per the schedule(See below) and submit online application at the TS-TET website http://tstet.cgg.gov.in between below given dates. TS TET Cell: o/o the Director, SCERT, Opp.E.Gate , LB Stadium Basheerbagh, Hyderabad-500004.